This lovely puzzle comes from Chris Smith’s (@aap03102) fantastic maths newsletter. Honestly, if you aren’t on the mailing list get on it. There is a concert, if we charge £5 for tickets we sell 120, for every £1 extra we charge we sell ten less tickets, for every £1 less we charge we sell ten more. What should we charge to maximise the profits? First I considered the profit itself, given there is no mention of costs, I thought it fair to assume that profit in this case was implied to be the same as turnover (or at least that costs wouldn’t change depending on tickets sold so wouldn’t affect the problem, from here on in I will use the term profit to represent turnover assuming they are equal). So it’s fair to assume that profit is the product of ticket price and tickets sold. Ticket Sales = 120 – 10x, x is a real number less than 12 as you can’t have a negative number if audience members. Profit = (5 + x)(120 – 10x), where x is any real number less than twelve. The final step was to maximise the function. It’s a simple quadratic, my first thought was to expand then complete the square, or use calculus, but then I realised that it would be much easier to use the symmetry of the parabola and just find the midpoint of tge roots. The roots are obvious from our function as it is already in factorised form. 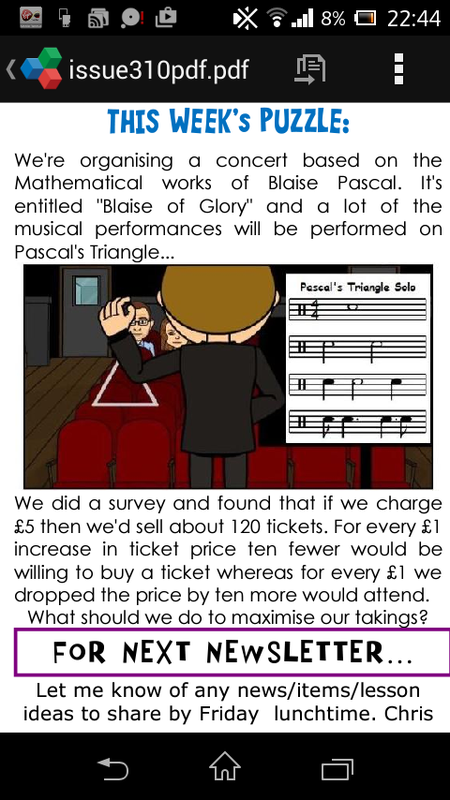 This assumes profit is a continuous function and that a non – integer amount of pounds increase or decrease would increase or decrease the ticket sales proportionally, Ie a 50p increase would decrease sales by 5. This isn’t explicitly stated in the problem, so if only integer increases were allowed then £8 or £9 would give the same profit as each other, which would be tge maximum. I just popped it into Excel and out came the answer! where x = price of a ticket. Aye, thats a nice method. Carnival Of Mathematics #120 | Math Misery?